The USB Trolley Speaker supports Bluetooth connection, AUX/Micro SD/USB input,FM Radio. The mini portable speaker enjoy your favorite music in your phone or old music in the CD player. Plug in guitar or microphone to get your friends involved. The portable 3d speaker colorful lights automatically flash as the rhythm of the music changes. Our portable speakers have a good stereo effect on the placement, like a portable speaker and a large speaker. It can be applied to any scene and saves space. Each part of this product has a high degree of fit, and the overall craftsmanship is exquisite and artistic. This compact, portable wireless speaker delivers powerful sound, and realistic sound immediately surrounds the listener into the ocean of sound. 1. The dustproof iron mesh cover is sturdy and durable, dustproof and pressure resistant. 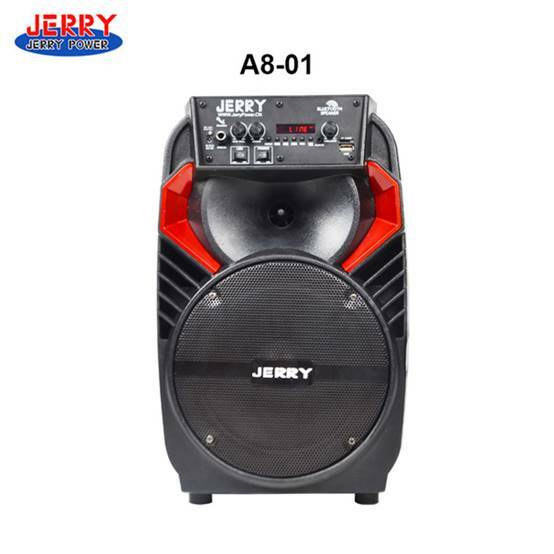 It can prevent damage to the speaker unit and prolong the service life of the speaker. 2. The bottom has a bracket hole that can be used with the speaker bracket to keep the speaker away from the ground. 3. USB Trolley Speaker has USB/SD, wired microphone amplification, and supports MP3 audio signal input and remote song selection. 4. It can be recharged and is stable and reliable. 5. The high-fidelity speaker gives you a clear sound experience, and it has an extraordinary volume. In order to make the life of the battery longer, please charge the battery on the day of running out. The longer the interval is, the more damage the battery will be. If it is not used for a long time, it must be kept charged for one month.